It is unclear whether A. G. Becker had in mind a plan of management succession, his death being unexpected and untimely. As far as can be determined, at the time of A. G.'s death, both Robert Schaffner and David Stern held the title of Vice President. Both were nephews of Mr. Becker. Bob Schaffner was 49, and had grown up in the business for 32 years, since its founding. David Stern was 45, having joined his uncle just out of college in 1902 (and, it will be remembered, he started as an office boy!). Dave Stern had been in the business for 23 years. It was probably considered too early for James Becker, age 31, in the business for only four years, to have been considered for top leadership at this time, but shortly after his father’s death, he was elected a Vice President. In a newspaper report in 1929, Schaffner is referred to as President and David Stern as Vice President of A. G. Becker & Co. - titles which presumably were taken or confirmed shortly after Mr. Becker’s death. By the mid-thirties, newspaper stories referred to Schaffner as Chairman, and in the 1960 obituary, David Stern was described as having become President in 1936. This joint leadership between Schaffner and Stern was thus maintained for some 20 years, until Robert Schaffner’s death in 1946, at which time David Stern became Chairman, and James Becker was elected President. The archives include a copy of a 1926 agreement among Robert Schaffner, David Stern, James Becker, and Moses Shire (a brother-in-law of A. G.) providing for the ownership of the firm going forward, effective July 1, 1925. The agreement provided that, as of that date, the business would be owned by these four men, with the first three each owning 31.5% and Moses Shire, 5.5%. It may be assumed that since its incorporation in 1894, or shortly thereafter, and until the effective date of this 1926 agreement, A. G. Becker personally owned all the shares of A. G. Becker & Co. Both Schaffner and Stern were steeped in the commercial paper business, especially Schaffner, who worked daily side-by-side with his uncle, for some 20 years, and solely in the commercial paper business. It was also during this period that A. G. was contacting and repaying depositors in the old Schaffner Bank. It will also be remembered that Robert Schaffner’s plans to attend Harvard were dashed by his father’s suicide, and following that, the sudden need to avoid or reduce expenses, and support the family. By 1925, Bob Schaffner was deeply familiar with the commercial paper business, but joining David Stern likely gave strong support to their uncle’s decision, in about 1915, to substantially expand and broaden the business. About 1918-1919, Robert Schaffner became closely involved with the Goodyear Tire & Rubber Company - perhaps via the company’s commercial paper banker. In late 1920, money was tight and short-term interest rates peaked, much like the situation in 1907. And much like that of Westinghouse in that earlier period, Goodyear’s business was rapidly expanding, fundamentally profitable, but cash-short at a time of declining rubber prices. Goodyear went into a reorganization, and Schaffner was authorized to seek $10 million in funding for the company. Of this amount, he committed $3 million from Becker, and approached a number of banks and securities firms for the balance. All such parties turned him down except, ultimately, Goldman Sachs and William Read & Co. This firm was just in the process of becoming Dillon, Read & Co. under the leadership of Wall Street's newest wunderkind, Clarence Dillon. Schaffner went on the Goodyear Board in 1921 and participated on a reorganization committee. However, Dillon, Read & Co. became the manager of a series of syndicated financings by Goodyear in which Becker had a prominent participation. By 1927, despite a number of law suits, Goodyear was back on its feet and quite profitable, with Schaffner continuing as a Board member. Among other interests, Schaffner had been following the economic situation in Germany for many years, having traveled there extensively before and after World War I. It will be remembered that in April 1915, Becker was a key underwriter and distributor of the $10 million issue of 5% Notes of the German Imperial Government, and participated significantly in the offering at about the same time of $10 million long-term bonds of the German Government payable in German currency. The firm’s strong role in this business, and perhaps A. G. Becker’s personal encouragement, were probably among the reasons for Bob Schaffner’s keen interest in and visits to Germany. As described earlier, the Treaty of Versailles was signed in June 1919. This event introduced a period of great instability and chaos in Germany, too complex to describe here in any detail. The monetary and economic situation in Germany included very high unemployment, low production, hyperinflation, a shortage of food and other necessities of life, governmental change and instability, an occupation by foreign troops of the Ruhr, intensive passive resistance, and labor strikes, among other significant and adverse conditions. During this period, too, the Reparations Commission had met in 1922 and established a schedule of payments to be made by Germany with respect to which it defaulted in 1923. Presumably these developments were being keenly observed by A. G. Becker himself as well as by his nephew, Robert Schaffner, either from afar or on site. As a component of the Dawes Plan, bankers in nine countries, under the guidance of their national governments, agreed to underwrite and simultaneously distribute a 25-year External Loan (later known as the “Dawes Loan”) to the German Government denominated in their local currencies, and having an aggregate value of $190 million, which issuance took place on October 10, 1924. J. P. Morgan & Co. was the lead underwriter on the U.S. portion of this funding ($110 million). The U.S. syndicate consisted of some fifty U.S. investment banking houses (including at the time a number of “commercial” banks) from which group A. G. Becker & Co. was conspicuously absent - for reasons that are unknown. Tombstones (advertisements of financial transactions) in the Tribune announcing German issuer financing in 1925 and 1926 regularly listed the amounts of issuer reparation payments, if an obligation existed. A Becker ad on November 2, 1926, with a headline “German Conditions” described the steady progress of the German economy with increased production, greater employment, and larger consumption, as well as a positive trade balance. The ad reported that German bonds offered publicly in the U.S. in the last two years totaled some 60 issues with an aggregate par value of over $560 million and aggregate offering prices of $525 million. Fifty-two of these issues were reported to be selling at an aggregate of $39 million above their offering prices. The Tribune went on to report that Schaffner and Friday could envision a substantial need for long-term capital in Germany. An advertisement by Becker in November 1926 comments on the “steady industrial progress” in Germany, with greater employment and larger consumption. As a result of these efforts, during the years 1925-29, A. G. Becker & Co. was a lead underwriter in providing capital to various German companies and municipalities for the improvement of their physical facilities, including Free State of Anhalt; State of Wurttemberg; Hugo Stinnes Enterprises; Mannheim and Palatinate Electric Companies; Unterelbe Power & Light Company; German Building & Land Bank; and Koholyt Corporation. As noted later, Irving Sherman, who joined the New York office of Becker in 1926, was probably hired in part to assist Schaffner in developing these relationships and carrying out these financings. Hugo Stinnes died in April 1924, leaving a wife and five children, of whom two boys, Edmund and Hugo Jr., were expected to take over leadership of the wide-flung Stinnes resources. Fairly promptly after Hugo Stinnes’s death, his wife selected Hugo Jr. to head most of the Stinnes resources which, along with other factors, led to life-long rancor between the Stinnes brothers. After Hugo Stinnes’s death, it was clear that a large portion of the Stinnes assets had been funded with bank debt which could not be repaid when due. Thus, the lending banks soon took over these assets, in what was essentially a receivership, and commenced a liquidation program. By late 1926, the loans by German banks had been reduced to the $17-20 million range. The Stinnes assets were placed in two Maryland corporations, one, the Hugo Stinnes Corporation, and the other, Hugo Stinnes Industries. A. G. Becker, partnering with Halsey, Stuart, co-managed a $25 million underwriting of 10 and 20 year debentures respectively for HSC and HSI. The debentures carried warrants for the purchase of HSC shares. It is not clear who originated the Stinnes connection but presumably it was Robert Schaffner and/or Irving Sherman. If Sherman was not the originator, he clearly became the ongoing connection with the Stinnes interests once he established the Berlin office in 1928. The genesis of the Halsey, Stuart involvement is not known. In 1939, the National Shawmut Bank published an interesting horizontal, fold-out, graphic chart showing money rates in the U.S. from 1900 to 1939. Very aptly, the five-year period 1925-1929 was labeled “widespread business prosperity and raging speculation.” It is interesting to note that commercial paper outstanding in the U.S. peaked in 1924 at about $866 million and per annum discount rates increased to 5 1/2%. By the end of 1929, outstandings had drifted down to just over $400 million while rates spiked to 6 1/2%. 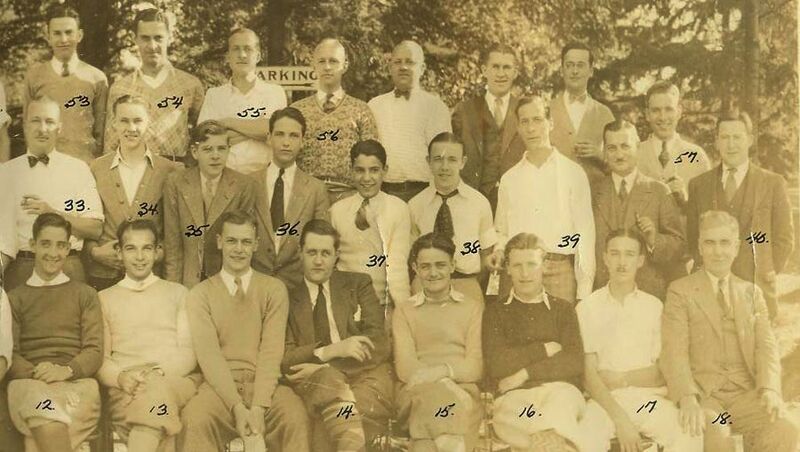 A. G. Becker, had he lived during the late 1920s, would have been happy to see the enthusiasm and effectiveness of the organization he had built, especially the young leadership group he had assembled in the decade before his death. But he might have had some misgivings, and clearly some caution, about the steady rise in common stock values and the influence on them of unrestrained, highly abundant, speculative margin account credit. As to the quality of U.S. industrial and commercial companies which the firm was sponsoring as managing underwriter, A. G. would have had little quarrel. It was during this period from 1925 through 1929 that the firm’s relationships with such companies as Goodyear; Sears Roebuck; Interstate Steel; Inland Steel; Pure Oil; and Commercial Investment Trust Corporation (CIT) were enhanced. And at the same time, new significant relationships were established with such companies as Auto Strop (which company later merged with Gillette); Monsanto Chemical Works; Abbott Laboratories; John Morrell; F. and R. Lazarus (later Federated Department Stores); Rike Kumler; Material Service Corporation; Chicago Pneumatic; and Parker Pen. The archives hold an impressive 1930 research report on Monsanto, the IPO of which was managed by Becker in the 1920s. Monsanto was then a leading fine chemicals manufacturer with sales of some $18 million. Mr. Becker would undoubtedly have been proud of these new relationships. As some readers of this Chronicle may know, in about 1960, A. G. Becker & Co. initiated a specialization in the short-, intermediate-, and longer-term financing of companies creating and owning installment receivables - broadly called “finance” companies. We were a national leader in this field by 1970, especially in the organization and funding of “captive finance companies.” Our leading role as a commercial paper dealer was fundamental to this effort. However, it is interesting to note that this was the second Becker effort in this direction. In the 1920s, Becker was an early leader in financing this newly emerging industry. As an article in the New York Times of August 2, 1925, reported, consumer debt from the new field of installment purchasing then totaled on a national basis some $3 billion. The installment plan sale was pioneered in the retailing of furniture and pianos, starting as early as 1908, and the sales method was soon applied to the sale of automobiles. Finance contracts were considered too risky for banks to own. Thus, finance companies came into being to purchase installment contracts from originating retailers, borrowing funds from banks for some of their needs, financing the balance with long-term senior and (later) subordinated debt, preferred stock, and common equity. The employment of leverage with preferred stock and longer-term debt financing, the ability to tap the lower cost commercial paper market for some short-term borrowings, along with relatively high interest rates on contract purchase prices, efficient operations, sound underwriting guidelines, and, presumably, well-managed credit losses, resulted in relatively high returns on equity capital. 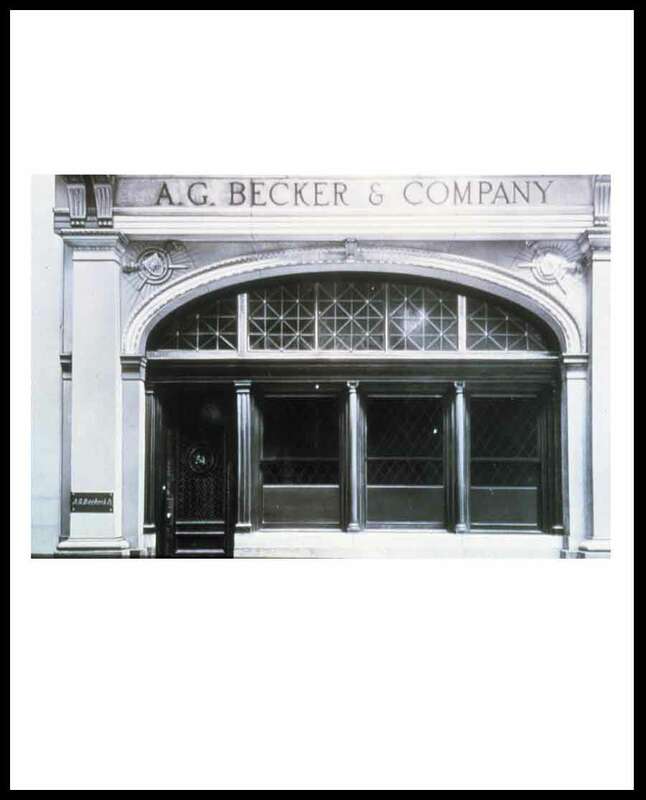 In 1924, Becker was a lead underwriter of an issue of Secured Collateral Ten Year Notes of the Yellow Manufacturing Acceptance Corp., a subsidiary of the Yellow Cab Manufacturing Co. and funder of the installment sale of its equipment to taxi and other transportation businesses. General Motors Acceptance Company, an early “captive finance company,” was not organized until 1919 and in its first five years, according to the New York Times, financed in that period the purchase of over 700,000 cars and began to finance GM dealer inventories as well as consumer purchases. In late 1924, more than 800 finance companies formed the National Association of Finance Companies (“NAFC”) at an inaugural meeting in Chicago. A New York Times article reported that a “leading spirit” in the formation of the NAFC was the National Bond & Investment Company, a Chicago based corporation formed in 1921 by Melville Rothschild. NBIC had the early support of Becker through managed underwritings starting in 1921. The 2008 decline and debacle in the American securities markets was broadly attributed to the unsound practices being followed in creating and marketing bonds collateralized by mortgages - so called “mortgage-backed securities” or “collateralized debt obligations (“CDOs”)." In many cases, the mortgages involved no down payment by the property purchaser and widespread, loosely administered, if not bogus, documentation. In the end, there was not any well-based criticism of the basic concepts of monetizing mortgage contracts and linking the bond market to the mortgage market - there was just extensive corruption of a basically good idea. The origination of mortgage-backed securities was generally attributed to Lewis Ranieri and associates at Salomon Brothers in the 1980 decade - and it very intimately involved FNMA (Fannie Mae). With the above summary in mind, it is of interest that starting in August 1927, A. G. Becker & Co., working with colleagues at the Foreman Banks (which since 1862 had been a leading mortgage lender in the Chicago area), organized a series of offerings of “first mortgage participation certificates.” These securities were backed, to the extent of their principal amount, by an undivided share in a pool of first mortgages on improved residential property originated, assembled, and held in Trust by Foreman, or the Trust otherwise owning obligations of the U.S., or cash. No mortgage in the Trust could exceed 60% of the fair market value of the secured property. The mortgages in the Trust were to be diversified as to size, type of property, maturity, maker, and locations in the Chicago area. The certificates had an expected term of 10 years with principal and interest payable semiannually. Denominations of $500, $1,000 and $5,000 were offered publicly and the certificates were traded on the Chicago Stock Exchange. Becker offered three series of these certificates respectively in August and December of 1927, which in February 1928 totaled $6 million. We are thus again reminded that financial history repeats itself. From 1920 forward, and especially between 1925 and 1929, common stock market values were quite often influenced - and, in hindsight, one might realistically say “manipulated” - by “pools” managed by their “operators.” Especially targeted were thinly traded stocks in which a pool sponsor could take concentrated long positions, promote and draw in a public following, and deftly ease out of (“dump”) the position with a profit. The New York Stock Exchange formed a Business Conduct Committee to help police these activities, but the targeted securities were regularly identified in the press, and the values of a wide range of listed and unlisted securities were systematically “influenced” by pool purchases and sales. At the same time, it was during this period that the individual “public” investment in the stock market grew substantially and speculatively. Wall Street and LaSalle Street responded to this growth in unsophisticated demand by creating investment trusts or securities-holding companies in which the public could invest in a diversified portfolio under “expert” management. Becker helped to originate a variety of such open-ended, “blind trust” entities between mid-1927 and the fall of 1929, as summarized below. July 1927. With Domestic and Foreign Investors Corporation, Becker privately placed $2½ million in debentures with common stock warrants. Becker owned the preferred and common stock. February 1929. National Securities Investment Company was organized by Becker jointly with George Pick & Co. “to deal in domestic and foreign securities.” Becker managed an offering of $20 million of Cumulative Preferred Stock with Common Stock and Warrants. Becker and Pick owned the common stock. May 1929. North and South American Corporation. NSAC was organized by A. G. Becker & Co. jointly with Baker, Kellogg & Co., Inc., and American Founders Corporation “for the purpose of acquiring equity investments in foreign countries and the United States, and to aid investing companies and other financial institutions in the management of their portfolios in consideration of fees or the acquisition of equity interests in such institutions,” and a range of other securities investment, dealing, underwriting, and trading activities. Becker managed the public sale of $9 million in Class A common stock with the founding group owning all the common stock. June 1929. A. G. Becker & Co. was to be a member of the group (consisting of such firms as Field, Glore; Kuhn, Loeb; First National of Boston; W. A. Harriman, and some eleven other firms) controlling American and Continental Corporation, and United National Corporation, with the view that the banking houses involved would shortly be handling the sale of common stock in A&CC. August 1929. Becker, jointly with Lawrence Stern & Co., organized the Manhattan-Dearborn Corporation, and jointly underwrote the sale of 375,000 shares of common stock, of which 190,000 shares were taken up for investment by the bankers and closely affiliated interests. Total proceeds of the offer were $18,750,000. The principal purpose of M-DC was “to buy, hold and sell real property and interests therein,” but the corporation was also authorized “to buy, hold, sell, and trade in securities (and) participate in syndicates and underwriting, and engage in such other activities” as the Board might determine from time to time. The policies of M-DC were supervised by five officers from Stern and four officers from Becker, along with the Stern Board members including such prominent Chicagoans as William Wrigley, John Hertz, Albert Lasker, and Herbert Bayard Swope. Stern was to manage M-DC under a ten-year contract and to receive compensation only if M-DC earned 8% on invested capital, and if so, took 20% of the profits above such 8%, measured on a cumulative basis. (A pattern very similar to recent compensation arrangements in various hedge funds). Somewhat related to the above activities, in late 1928, Becker teamed up with Lawrence Stern to establish a company - The Lawbeck Corporation - to provide short-term funding of building construction of properties that in the opinion of the Lawbeck management would, upon completion, be suitable and attractive for permanent financing by insurance companies or other conservative lending institutions. The offering consisted of a unit of one share of Preferred Stock with one share of Common Stock, comprising 17% of Lawbeck’s common shares, with Becker and Stern owning the balance. The longer term success (or lack thereof) of the various investment holding companies organized in whole or in part by A. G. Becker & Co., is not known. As described in some of Becker's Investment Bulletins (Link), a number of investment companies were sound and had a reasonable outlook as of the early 1930s. However, a special analysis would be needed to determine the true outcome of the various companies organized by Becker in the period 1927-29. From its founding in 1893, and probably carrying on practices developed over the prior 20 years within two former banking organizations, the heart of A. G. Becker & Co.’s commercial paper business centered on credit analysis and judgment. In the early years of the firm, the collection of financial information, and the sorting out and evaluation of that information, was probably carried out by A. G. Becker himself. Later on, into the 1900s, when financial statements became more available, A. G. Becker probably reviewed this data, and/or gave final approval (or disapproval) to the evaluations and recommendations of junior colleagues. About 1912, with the advent of long-term securities underwriting and sales, and then blossoming in the 1915-25 period, based on occasional references, the firm’s credit analysis was carried out by the “statistical department,” sometimes referred to as the “research and statistical,” or elsewhere, the “analytical” department. The work of this department was still very “credit” oriented, since the firm continued its emphasis on the underwriting, distribution, and inventorying of short-term notes, bonds, and preferred stocks. Contemporaneously, a series of three ads with the headline “Changing America” was published highlighting the shift of the American economy from an agricultural to an industrial base, with each ad listing some key measures as evidence of this shift, and forecasting substantial future growth in the U.S. industrial-based economy. In late 1927, Becker published an advertisement which symbolized the successful transition of the firm into a nationally recognized general securities business handling a full range of investments - the goal the founder had established about one decade earlier. The firm’s advertising programs from 1900 forward are described in more detail in Appendix C-5. The development within the firm of a department systematically completing securities and economic research, data collection, analysis, and publication was possibly started by A. G. Becker in the year or so before his death. Possibly it was at the behest of Robert Schaffner; certainly Schaffner implemented the program. The extension of a shorter-term credit analysis process into longer-term individual company and macroeconomics research and analysis was evidently carried out under the management of Jay Dunne. But Dunne may have been operating under the supervision and/or inspiration of Dr. David Friday, who also probably collected and massaged a good deal of the basic economic data for various industry and company studies that were published by Becker at the time. In late 1930, Friday became President of Domestic and Foreign Investors Corporation, an affiliate of the firm organized in 1927 as previously noted. It is not clear how long Friday occupied this role. The Becker relationship with Friday appears to have dwindled in the mid-1930s. However, press reports on Friday’s role as a “nationally prominent economist” and a member of a cadre of top U.S. economists continued well into the 1940s, right up to Friday’s death in 1945. Overall, the underwriting and distribution of publicly offered securities by Becker was quite active in the 1925-29 period. The firm was the manager or a co-manager in some 40 offerings during these almost five years, and regularly participated in the syndicated offerings of the major utility and railroad companies. The firm was clearly favored with major participations in offerings of short- to intermediate-term serial notes and various forms of preferred stocks. One can presume that Becker’s long established distribution system for commercial paper, primarily to banks, was the foundation for Becker’s placement of fixed-income securities. But this basic distribution capability was being steadily augmented by dealing with and marketing common stocks to wealthy individuals and various institutions including trust and insurance companies. There is no question that the capabilities of Becker’s sales force both in Chicago and New York, as initiated by Mr. Becker himself a decade earlier, were paying off handsomely in this five-year period after his untimely death. As noted earlier, Chicagoan Vladamar (June) Johnston was sent to the New York office (then at 111 Broadway) to become manager of all “Eastern territory” business. Surely, his charter was to expand the sales force, resulting with the need for more space. Shortly after Johnston’s arrival in New York, in May 1926, the firm purchased a six-story building at 54 Pine Street (DI#1123) with cashier windows and banking operations on the first floor, and sales, corporate finance, and administrative offices on the upper floors, including spacious offices for Johnston as well as for Robert Schaffner, who by this period was spending considerable time on Wall Street. On a personal basis, in the midst of the hectic business of the firm, James Becker, in May 1928, married Hortense W. Koller of New York City. Hortense was the daughter of Karl Koller, famous internationally for discovering various uses of anesthesia. Hortense was a graduate of Barnard College and worked at the time of her marriage on the staff of the Herald Tribune Sunday Magazine. After a brief honeymoon, the couple settled in the Chicago area. The decade of the 1920s closed with what must have been one of the firm’s first “M&A” transactions. In January 1929, Jim Becker, who had developed relationships with the managements and owners of various retailing companies throughout the nation, was instrumental in bringing about the consolidation of Weber & Heilbroner, Fashion Park, Inc., and Stein-Bloch Company to form a new company, Fashion Park Associates. And at about the same time as the above deal, a group of Chicago’s leading businessmen purchased the Arlington Park Race Track. The group was reported to include David Stern and Robert Schaffner. It is also interesting to note that in the mid-1920s a “Commercial Paper Credit Committee” was organized within the IBA. The Committee presumably met once a year at the IBA convention, with James Becker being the firm’s representative. Per the minutes of a meeting of the Committee in late 1928, it was proposed that the “commission” charged by commercial paper dealers be fixed at 1/4% to which decision Jim Becker, solely, appears to have disagreed. He pointed out that certain issuers with substantial outstandings merited a lower cost for the distribution and banking services provided. It was also clear that Jim Becker found the discussion distasteful. The minutes of this meeting also make mention of the “promiscuous bidding” taking place in the field by some of the dealers’ employees. The competitiveness of the Becker organization has deep roots. In a review of the firm’s history and archives, and in the collection of additional Tribune references, the newspaper advertising programs of A. G. Becker & Co. over the firm’s first 36 years stand out as to their character and variety. They say something about the changing character of the firm’s activities, and they give us insights into the economic environment of these times. Also, the Becker ads, taken all together over this time period, provide a superb education in the principles of securities selection and portfolio management; good investment banking practice and policy; how enterprises grow; and how to carry out a thoughtful, informative, and effective advertising and branding program. For more detail about the advertising programs over the life of A. G. Becker & Co., see Appendix -5. A sense of the growth and prosperity of the firm since its founding in 1893 through 1929 can also be deduced from the expansion and spread of office locations over those 36 years. The Chicago office had locations during this period at some six different addresses as the firm grew and diversified. 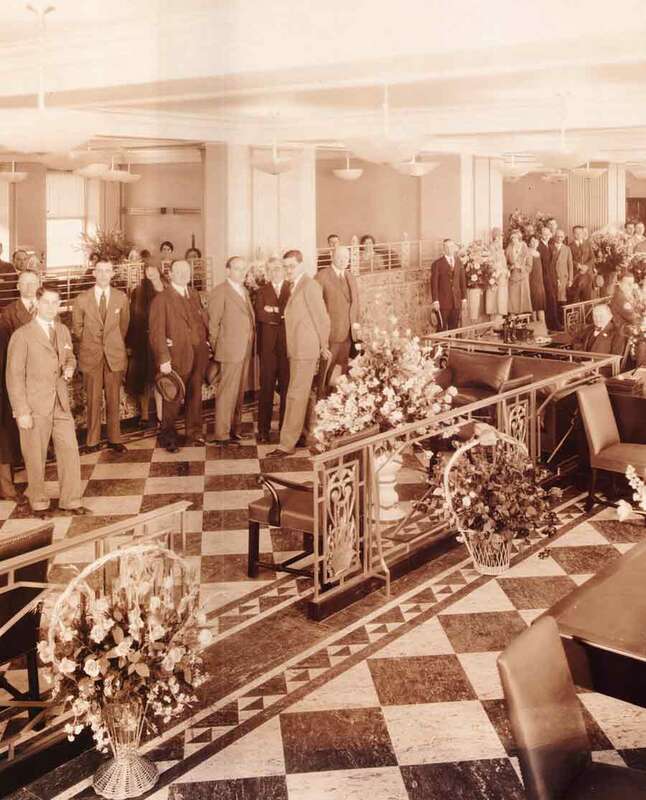 On May 15, 1928, the firm very proudly announced the opening of a new and enlarged Chicago office at 100 South LaSalle. The firm occupied the entire seventh floor along with the ground floor space on the corner of LaSalle and Monroe. There was a private elevator to the seventh floor, which floor was completely occupied by Becker. The entrance to the offices on the seventh floor was imposing. Among those “old timers” who can be identified in the above 1928 Chicago office photo are Herb Schaffner (left center, forward, on the diamond floor); Al Pearson (to the far right in the photo, seated and turned to the camera); and Herb Elsholz (seated at a desk just over the head of Al Pearson and back beyond the next man). The New York office was not opened until 1919, and from the start was apparently poorly managed. The office was located in the 111 Broadway office building. As earlier noted, Vladamar Johnston, who received his early training as a bond salesman in Halsey, Stuart’s Chicago office before moving over to Becker, was transferred to New York in 1925. He led an Eastern sales force expansion, occupying the newly acquired building on Pine Street, servicing all clients in the Eastern states. These offices served as the firm’s New York location until 1955. As in Chicago, the New York office apparently also had a summer outing, but in this case, the outing may only have included the sales force. 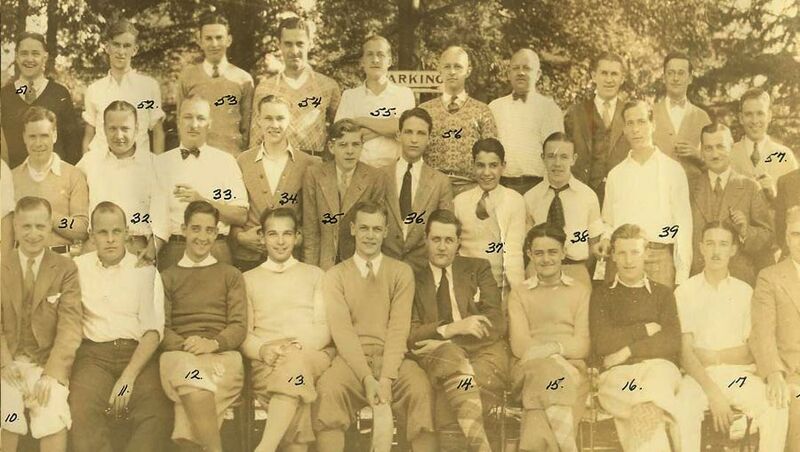 The archives have an interesting group photo, apparently of a New York office golf outing at the Briarcliff Club. 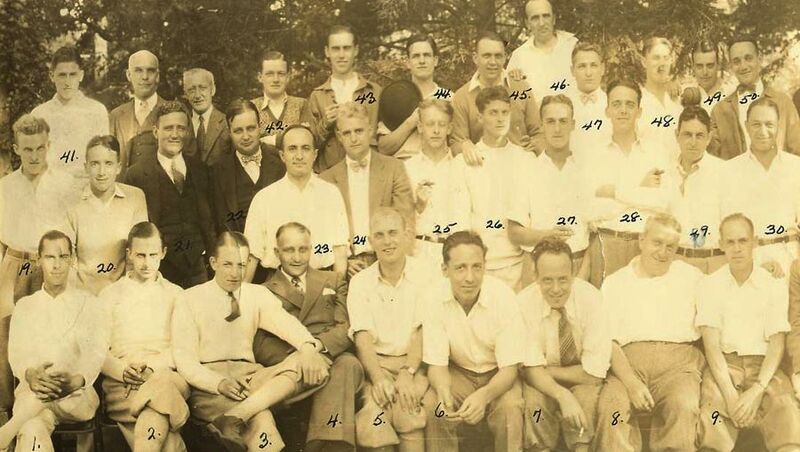 Everyone in the photo is nicely numbered but, unfortunately, the archives do not contain the key to the photo. The photo takes three sections to show its entirety; apologies for the missing thin central portion. Left, Right center, and Far right. In 1919, contemporaneous with the opening of a New York office at 111 Broadway, commercial paper distribution offices were opened in St. Louis, headed by Walter McEvoy, shortly followed by an office in San Francisco under Bill Eaton. In mid- to late 1924, two other West Coast offices were opened in Los Angeles and Seattle, and in 1926, in Spokane, all under the oversight of Eaton working out of San Francisco. Offices in Minneapolis and Milwaukee also opened in 1926. An office in Berlin was opened in 1928 by Irving H. Sherman, who joined Becker’s New York office in 1926. Irv graduated from Cornell in 1922 then worked as a faculty assistant for a year and then for DuPont, where he learned to speak German. After joining Becker, Irv worked in sales in the New York office for over a year, after which he began to assist Robert Schaffner in the development of German dollar-bond financings in the late 1920s, before going to Berlin. As will be reported later, Irv returned to the New York Office in 1939. According to James, in Growth of Chicago Banks, Becker, in the late 1920s, also opened offices in Des Moines and Sioux City. The archives confirm that these offices existed at some point in time but it is not clear when they opened or closed. As of late 1929, Becker was geographically represented in two primary offices - Chicago and New York - and maintained important fixed-income sales and commercial-paper marketing and issuer relationship personnel in St. Louis, San Francisco, Los Angeles, Seattle, Portland, Spokane, Minneapolis, and Milwaukee, and a sole foreign office in Berlin. Based on sales force production reports kept by Herb Schaffner, the firm had by 1929 at least 50 securities salesmen overall (especially dealing in bonds, notes, and commercial paper), in all offices, with over 30 in Chicago, over 15 in New York, and at least one each in the West Coast, Milwaukee, and Minneapolis offices. By 1929, the firm was a well-established managing and participating underwriter in syndicated public offerings on a national basis, especially of bonds and preferred stocks, but with a growing business in conservative common stocks - and of course, in the issuance and placement of commercial paper. Becker was also one of the leaders in the underwriting and distribution of Intermediate Credit Bank securities. To these capabilities was added a specialization in the underwriting and distribution in the U.S. of the securities of German municipalities and selected major German industrial companies, and of selected other foreign entities. Also, as noted earlier, the firm was of necessity a dealer and market maker in the wide range of bonds, preferred stocks, and “safe” common stocks that it was recommending, and thus maintaining active markets and inventories in many securities.